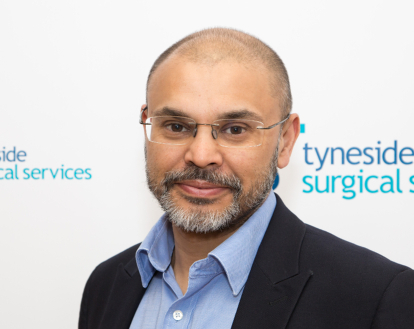 Sam Dalal was appointed as a Consultant Orthopaedic Hand and Wrist Surgeon at Sunderland Royal Hospital in 2012. He is on the specialist register as a Consultant Orthopaedic Surgeon and specialises in conditions of the hand and wrist. Main areas of clinical interest relate to conditions of the hand and wrist and include the treatment of arthritis, Dupuytren’s disease, nerve compression syndromes, sports injuries, fractures and soft tissue injuries. He qualified in medicine from the University of Sheffield in 1997. Specialist training in Trauma and Orthopaedic Surgery was undertaken in the North West of England, leading to the Fellowship in Trauma and Orthopaedic Surgery in 2009. Specialist training was completed with Hand and Wrist Fellowships at the Upper Limb Unit in Wrightington, the Pulvertaft Hand Centre in Derby and at the Hand and UpperExtremity Service at the Massachusetts General Hospital in Boston, USA. He has an MSc in Medical Engineering, awarded from the University of Leeds in 2007.